The Hotel San Marco offers its guests a friendly and hospitable atmosphere. The cuisine offers exquisitely prepared dishes with a choice of typical regional and national dishes, accompanied by tempting buffets. Near the San Pellegrino ski area, the Hotel Miralago, run by Ivano and Carmen Pellegrin, is situated in a quiet and sunny position close to the San Pellegrino Pass. 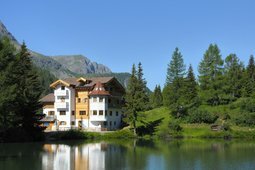 The hotel offers comfortable rooms with furniture in the rustic style typical of the mountains.